Students are on the move again. All across the country during November, there have been at least two days of protests, marches and sit-ins, sometimes peacefully, sometimes a little more forcefully. More protests are planned for the coming weeks. We all know the cause of the unrest. The Government plans to allow universities to increase tuition fees. There is currently a cap of £3290 per year, but this will be removed from September 2012, replaced with a maximum of £9000 per year. Any universities wishing to charge more than £6000 per year will have to put in place measures, such as offering bursaries, to encourage students from poorer backgrounds to apply. All of these changes come about because of recommendations in the Brown Review, published in October. For those of us of a certain age, all of this will bring back memories of a previous set of demonstrations. In the late 1980s and early 1990s students across the country brought universities to a standstill over plans to introduce the first student loans. The size of these loans was minuscule compared with those students take out today. But the demonstrators would probably say they were vindicated, in that those loans set a precedent for and led directly to the massive debts inflicted on the student population today. One striking difference between these protests and those of 20 years ago, however, is the involvement of school pupils. A-Level students are fully aware of the implications of the cuts on their futures, not just over the next three years, but, if the plans go ahead, for years and decades to come. The debt levels some will accrue to gain a university education are truly mind-boggling. David Cameron is of course a prime target for blame. But Nick Clegg is taking a huge amount of criticism as well. Before the general election in May, the Liberal Democrats pledged to oppose any move to increase tuition fees. Every member of the party signed a pledge to honour this commitment and vote against any such proposal. So understandably, ever since leading his party into a coalition with the Conservatives, Clegg has been attacked for abandoning these principles. Recently, however, it emerged that the Lib Dems had considered abandoning the commitment even before the election. Talking to students and teachers, it is this that has enraged them more than anything else. 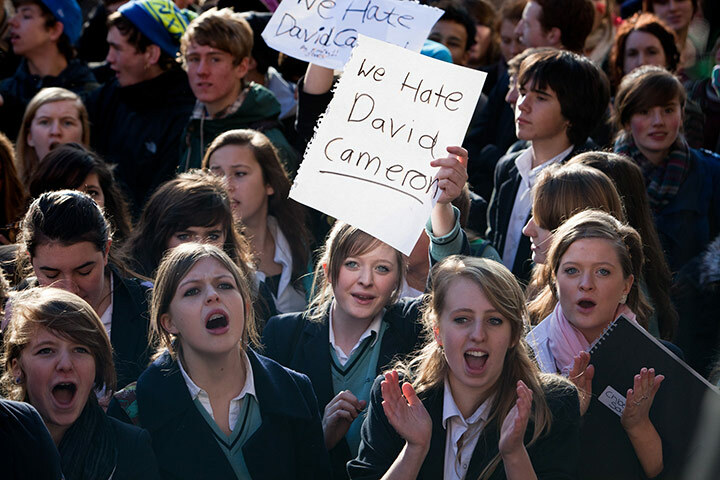 Now there is news that the government wants to cut funding to school sixth forms as well. Head teachers are warning of the drastic effects such changes could bring about, including loss of facilities and equipment, even teaching staff and an overall deterioration in the quality of A-Level teaching. Once again, on this blog, we put the case that, although we undoubtedly live in difficult times, these measures, both the university tuition fee rises and the cuts in sixth form budgets, are going far too far, far too fast. 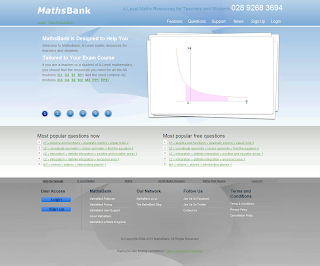 We're pleased to announce a new look for the main MathsBank site - we've been working hard to spruce the place up. We hope you find the new layout more pleasing on the eye and easier to navigate. What's more, to celebrate the new look, we're making all our resources completely free for the rest of the month of November. Why not take a look? There may still be a few things to tidy up, so if you spot anything missing or broken on the site, let us know. Please feel free to pass general comments on the new design too. We really value your feedback. promoting some fun Christmas themed resources through the month of December. Remember him? 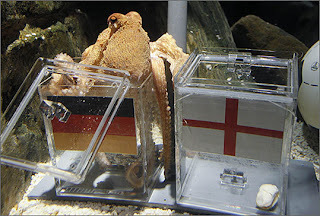 He was either the aquatic psychic that stunned and amused the football-watching world, or a very lucky guesser. Or some kind of heinous seafood stitch-up was taking place. During the 2010 World Cup, Paul the Octopus correctly predicted the winning team in each of Germany's six games, by choosing a mussel from a box emblazoned with the country's flag. He then went on to predict the winners, Spain, in the final against the Netherlands. Paul has sadly passed on to the great ocean in the sky to meet his eight-legged maker. But there is a replacement, imaginatively called Paul, now inhabiting the same tank as his predecessor. Will the prodigy prove to have the same psychic football-predicting powers? Will he last long enough to show us? - the European Championships are still 20 months away. What are the chances of predicting the winning team in 7 consecutive football matches, if each prediction has a 50:50 chance? NCETM have provided a PowerPoint presentation for teachers on this very topic and the introduction to probability and chance can form the basis for an interesting mathematical investigation. So long Paul, and thanks for all the super-natural ability.